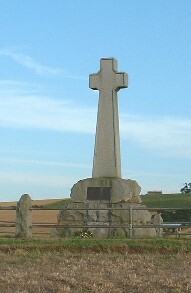 The battle of Flodden Field, near Branxton, in Northumberland. The opposing Scottish and English armies, led by James IV and the Thomas Howard, the Earl of Surrey (later 2nd Duke of Norfolk) respectively, were roughly similar in size, numbering between 20 and 30,000 men. The Scottish Camp on Flodden Hill was a favourable position which they had fortified. Surrey understanding this marched to outflank the Scots, positioning himself between them and Scotland. On the day of the battle James moved his army to Branxton Hill. Both forces had sophisticated artillery, but the lighter and more manoeuvrable pieces used by the English were more suited to the rain-soaked conditions of the hill and soon took effect. In the initial action Hume and Huntly on the Scots' right appeared to break the English left flank. The Scottish centre seeing the success advanced but they lost momentum on the boggy ground and their traditional long spears were overcome by the English billhooks. James joined the attack and ran into similar difficulties and the Scots formations broke down into hand to hand combat in the dip between the hill and Branxton with the Scots coming under effective fire from the English archers. The Scots dead were so mutilated that many of the bodies could not be identified, though the body believed to be that of James IV, pierced with arrows, his left hand almost severed from his arm by several wounds and his neck opened to the middle, was taken to Berwick and embalmed, "lapped" in a lead sheet and then to the Priory of Sheen, where it was kept finally in a lumber room 1 2. Elizabeth I's Master Glazier, Lancelot Young, found the head hewn off by "idle workmen for their foolish pleasure" and noticing it smelling sweetly, perhaps from the spices used it for embalming took it home but eventually charged the Sexton to have it taken to the charnel house 3 of St Michael's Church, Wood Street in the City of London for disposal 4 5 There is no record of the body after the 16th century and Sheen Priory buildings became dilapidated and were demolished in the 18th Century. The foundations lie under the 14th fairway of the the Outer Course of the Royal Mid Surrey Golf Club in Old Deer Park. There are also several legends concerning the disposal of his body. A sword, dagger and ring taken from the body are kept at the English College of Arms in London. Would it not be fitting in the year of the 500th Anniversary of the Battle for his body to be found and returned to Scotland to lay in rest with dignity, and for his possessions to be brought to Edinburgh Castle to accompany the Honours of Scotland? William, the 2nd Earl of Caithness fell at Flodden along with George Sinclair of Keiss, Henry, 3rd Lord Sinclair, Sir John Sinclair of Herdmanston and the Bishop of Caithness. He had raised a body of around 300 Caithness men. This was a catastrophe for Scotland and Caithness in particular, from which it would never recover fully. At the time the Earl of Caithness was under an attainder and so, it was said that when King James saw them in his ranks, he sent for the Earl and pardoned him. It is said thast the Earl asked for written confirmation , and so, with no parchment to hand, hastily wrote the pardon on a Sinclair drumhead. He sent it home with a member of Clan Gunn who was the only survivor of the Caithness force. The charter has been with the Earl of Fife since 1766. The day is also associated with Sinclair/Caithness folklore as the Sinclairs crossed the Ord of Caithness on a Monday wearing the Green tartan, and to this day it is deemed unlucky to cross the Ord on a Monday wearing Green. "The Flowers of the Forest are a' wede away". The lasses are lonely and dowie and wae. Ilk ane lifts her leglen, and hies her away. The Bandsters are lyart, and runkled and grey. The prime o' our land are cauld in the clay. Evening Telegraph: Letters: Alex Orr, Edinburgh "Given the interest shown in King Richard III, and given the timing of the Flodden anniversary, it is time for a renewed interest in the discovery of the resting place of the last Scottish king to die in battle"
Two stories are based on the discovery of skeletons, since disappeared, with a chain girdle about the waist which James IV wore in penance for the murder of his father James III at Sauchieburn. One story is that that James IV having escaped from the battlefield was murdered by one of his own nobles and thrown down the well at Hume Castle, where an iron girdled skeleton was found . Another relates to the discovery in the time of Cromwell of a skeleton girded with an iron chain and wrapped in a bull's skin in the ruins of Roxburgh Castle. A further legend is that a convicted criminal offered to show Regent Albany the King's grave 10 years after the battle, but Albany refused. This last was written by Robert Lindsay (1532-1586) in The History of Scotland, from 21 February, 1436 to March 1565 . The scanned edition online was published in 1728.
during the reign of James IV. William Sinclair of the House of Caithness - the county of Caithness, the most northerly of the mainland of Scotland - was under an attainder, although history never defined his crime. A high-spirited nobleman, & loyal to his King, he voluntarily raised 300 men & rushed to the assistance of King James. The Earl of Huntley was leading the right wing of the Scottish army & William Sinclair supported him valiantly. The night before the Battle of Flodden, as the Earl of Caithness led forward his troops, the King, watching them approach, cried out at sight of the fresh, green uniforms. Curiously he questioned his men, & when they told him that the fresh troops were under the leadership of the Earl of Caithness he exclaimed: "If that be William Sinclair, I will pardon him." The King ordered parchment brought to him, but none could be found; then, pointing to a drum, he ordered that the deed of forfeiture be written on the drum head. When it was complete, King James added his signature & commanded his men to cut it out. This pardon he presented to William Sinclair. The Earl, turning to one of his men, thrust the document into his hands, commanding: "Run with this to Caithness & put it into the hands of my Lady, for fear I fall in battle, & the title of the estate will still be hers." The following day the Scots suffered defeat. The Earl of Huntley deserted the field, but the Earl of Caithness, stood the ground, sacrificing his own life. All of his men-excepting the runner who had gone to Caithness with the pardon-perished. An amber flask in leather casing was strapped to the back of the runner bearing the pardon to the Lady of Caithness. Through generations of Sinclairs, this flask of the House of Caithness has come down to the possession of the sisters of the lineage of Sinclair. During the late war the brother of the Sinclair sisters volunteered in a Canadian battalion drafted in the home town of the Annapolis Valley, Nova Scotia. On the eve of his departure the historic flask of Caithness was filled with blackberry wine & stored in the dusk of a cupboard against the brother's return, when a toast should be proposed. The brother paid the supreme sacrifice at Vimy Ridge, but on Armistice Day these Sinclair sisters bravely brought into light the amber flask of wine, & carrying it proudly, they marched with the rejoicing mobs of the town streets. Visiting an old Scottish friend, the sisters of the House of Caithness unsealed the flask that had once been carried on the Field of Flodden, & in the Canadian home drank a toast to the boys then overseas. Sourced by Wanda Sinclair on the Sinclair Discussion Group.